This guidance will help you make an online Land and Buildings Transaction Tax (LBTT) lease review return. Separate guidance is available on using the online portal for submitting a LBTT return, including how to save a draft and amend a return, and ‘How to pay LBTT’, including setting up Direct Debit and BACS/CHAPS payment arrangements. This is not guidance about the tax itself. LBTT legislation guidance for taxpayers and agents is available separately on our website. Where we refer to further guidance, for example ‘see LBTT1001’, we mean references to that guidance. Practical guidance about how to complete the return is also available by clicking on the information bubble next to each question. Further information about using the online portal, including how to save a draft and amend a return, can be found in the ‘General guidance about the online LBTT return’. It is the tenant’s responsibility to ensure the LBTT return is complete and accurate. Where an agent is completing and submitting this on behalf of the taxpayer, you must certify, as part of the declaration on the final page, that the tenant(s) have declared that the return is correct and complete, and that the relevant date entered is correct. How much LBTT has already been paid on the lease. ‘original return/transaction’ means the first LBTT return submitted when the lease was granted, or when it became notifiable for the first time. Select the radio button to indicate that this return is being submitted for a ‘Review of a lease’. Enter the transaction reference of the LBTT return that was originally submitted for this lease. This should be entered in the following format - ‘RSXXXXXXX’. Select the radio button to indicate the event for which this return is being completed (see LBTT6014 and LBTT6017). increase in rent or extension of term for a lease causing it to become notifiable (paragraph 30 of schedule 19 - see LBTT6029). In these cases, the ‘Relevant Date’ of the originally submitted LBTT return should be entered instead of the ‘Effective Date’. assignation or termination of a lease (paragraph 11 of schedule 19 - see LBTT6017) - the day on which the lease is assigned or terminated. Note: If there are two or more tenants, go to the ‘List of Additional Tenants’ area near the bottom of the screen and select ‘Add’ each time you need to add an additional tenant (there are no limits to the number of tenants that can be added). You can edit or delete the information about any additional tenants by selecting ‘Edit’ and ‘Delete’ respectively. Questions for the ‘Agent Details’ sub-section. Select the option which is most relevant to the tenant. From the drop-down list select the relevant title (if any) of the tenant. Enter the surname (family name) of the tenant. Enter the first and middle name(s) (or non-family name) of the tenant. Enter a daytime telephone number that can be used to contact the tenant. You must answer either the National Insurance Number (NINO) question or the following (non-UK tax reference) question. Note: If you answer the NINO question, the answer field for the following (non-UK tax reference) question will be greyed out. Answer this question if the tenant is an individual. Give the correct NINO for the tenant – we will not accept a temporary NINO. If the tenant does not have a NINO then answer the question below. You must answer either this question or the previous (NINO) question. Note: If you answer this (non-UK tax reference) question, the answer field for the previous (NINO) question will be greyed out. If the tenant is based in the UK you should only answer this question if the tenant does not have a NINO. another recognised ID reference e.g. Child Benefit Number (if the tenant is aged under 16). If you answered the (non-UK tax reference) previous question then you must answer this question. Note: The answer field for this question will be greyed out until you have entered details for the previous (non-UK tax reference) question. Enter the name of the country where the non-UK tax reference, Passport Number, Driving Licence Number or other recognised ID was issued. Is the Tenant acting as a private individual? Answer ‘Yes’ if the tenant is acting in an individual capacity and not acting on behalf of any group of individuals, for example a trust, partnership or a company. Note: If you answer ‘No’, you must answer the ‘Is the Tenant acting as a trustee?’ and ‘Is the Tenant acting as representative partner?’ questions below. Enter the address of the tenant after the effective date of the land transaction, including the house (or office) name and number and postcode.You must also enter the name of the country to which the address relates. This is the address we will use if we need to correspond with the tenant involved in this transaction. Is the Tenant acting as a trustee? You must answer this question if you answered ‘No’ to the ‘Is the Tenant acting as a private individual?’ question. Answer ‘Yes’ if the tenant is acting as a trustee (see LBTT8001). Is the Tenant acting as representative partner? Answer ‘Yes’ if the tenant is acting on behalf of a partnership, is the representative partner as defined in paragraph 9 of schedule 17 to the LBTT(S)A 2013 and notice of the nomination has been given to us (see LBTT7004). If you have answered ‘Yes’ to either the ‘Is the Tenant acting as a trustee?’ or ‘Is the Tenant acting as representative partner?’ questions then enter the name of the relevant trust or partnership. Are the Tenant(s) and Landlord(s) connected? You must answer this question for all tenants. the trustees of a settlement of which the tenant or landlord is a settlor, or of which a person who is still alive and who is connected with them as a settlor. ‘Relative’ in this context means brother, sister, ancestor or lineal descendant. if a group of two or more persons have control of each company, and the groups either consist of the same persons or could be regarded as consisting of the same persons by treating (in one or more cases) a member of either group as replaced by a person with whom he is connected. Note: For these purposes a company includes a body corporate or unincorporated association. Enter the registered legal name of the tenant. If the trading name of the tenant is different from the ‘Legal Name’, enter the trading name of the tenant. You must answer either this question or the following ‘Charity Number’ question. Only one of these questions can be answered - if you answer the latter, this question will be greyed out. Enter the company registration number (CRN) if the company is registered at Companies House. Enter the Local Authority number, or N/A for other public bodies. You must answer either this question or the preceding ‘Company Number’ question (note: if you are claiming charities relief you must answer this question). Only one of these questions can be answered - if you answer the latter, this question will be greyed out. Enter the charity number if the tenant is a registered charity. Enter the name of the country where the company is registered. Answer ‘Yes’ if the tenant is acting as a trustee. Enter ‘Yes’ if the tenant and landlord are connected persons as defined under section 58 of the LBTT(S)A 2013. Enter the address of the tenant after the effective date of the land transaction, including the house (or office) name and number and postcode. You must also enter the name of the country to which the address relates. This is the address we will use if we need to correspond with the tenant(s) involved in this transaction. This sub-section should only be completed if an agent is completing and submitting the form on behalf of the tenant. The ‘Agent Details’ sub-section of the ‘About the Tenant’ section is accessed by selecting ‘Agent Details’. If any information is entered in this sub-section, the ‘Agent Name’ and declaration questions become mandatory, as well as one of the ‘Agent’s DX number and exchange’ or ‘Address’ questions. If the user of the portal has signed up as an agent, the agent details will be pre-populated on all LBTT returns with the information provided as part of the sign up process. The information that has been pre-populated can be edited if required on each return. The Agent Authorisation question must be answered for each return. Please remember if there are updates to the registration, this must be updated on the account - for details of how to do this, please see the relevant section of the ‘how to’ guidance. You must answer this question if you intend to enter any information in the ‘Agent Details’ sub-section of the ‘About the Tenant’ section of the return. Enter the full business name of the tenant’s agent. You must answer one or both of this question and the ‘Address’ field if you intend to enter any information in the ‘Agent Details’ sub-section of the ‘About the Tenant’ section of the return. Enter the DX or Legal Post Number of the tenant’s agent. Enter the full telephone number of the tenant’s agent (direct dial where available). Enter the email address of the tenant’s agent. Enter a reference meaningful to the tenant’s agent. You must answer one or both of this question and the ‘Agent’s DX number and exchange’ question if you intend to enter any information in the ‘Agent Details’ sub-section of the ‘About the Tenant’ section of the return. Enter the postal address of the tenant’s agent, including where applicable the postcode and country to which the address relates. I, agent for the tenant(s), confirm that I have authority to deal with all matters relating to this transaction on behalf of my client(s). You must answer this question. It will not be pre-populated as it will be specific to each client. Answer ‘Yes’ to this question if you, as an agent, have been given authority from your client (the tenant) to act on their behalf in relation to this transaction. This may lead to us contacting you, as an agent for this matter, in subsequent dealings with this transaction. You must have authority from your client in order to answer ‘Yes’ to this question and we may ask for you to provide evidence of this in the future. If you do not have authority from your client – answer “No”, we will correspond directly with your client in the address provided on the “About the Tenant” tab. The section will only enabled if you have a have selected ‘Assignation’ on the ‘About the Transaction’ section of the return. If the new tenant is a private individual enter their first name and surname. If the new tenant is not a private individual, enter the name of the business, charity, trust, etc. Enter the address of the new tenant after the effective date of the land transaction, including the house (or office) name and number and postcode. You must also enter the name of the country to which the address relates. This is the address we will use if we need to correspond with the new tenant who the lease has been assigned to. Enter a daytime telephone number that can be used to contact the new tenant. Note: This section will be prepopulated with the property details entered on the original LBTT return. If the property details are correct you can proceed to the next section of the return. If the property details are not correct you must enter the correct details following the guidance below. Note: If the land transaction involves two or more properties, go to the ‘List of Additional Properties’ area near the bottom of the screen and select ‘Add’ each time you need to add an additional property (there are no limits to the number of properties that can be added). You can edit or delete the information about any additional properties by selecting ‘Edit’ and ‘Delete’ respectively. 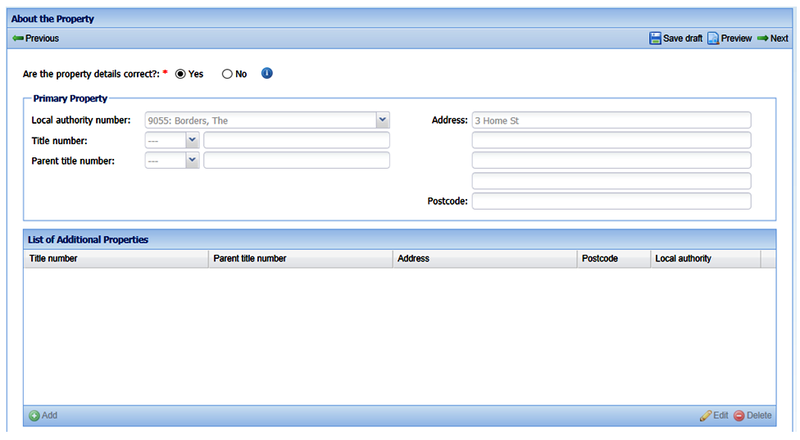 From the drop-down list select the local authority in whose area the property in the transaction is situated. If a property straddles a local authority boundary enter the code for the local authority in which most of the property falls. Note: Only complete this question if you know the full title number. Firstly, from the drop-down list select the appropriate county code for the property’s title number e.g. for Aberdeen select ‘ABN’. Secondly, in the free-text field to the right of the county code enter the property’s title number (if known). Note: Only complete this question if you know the full parent title number. If you do not know the title number of the property it is possible that it forms part of a larger area. Where this is the case, firstly select from the drop-down list the appropriate county code for the property’s parent title number e.g. for Aberdeen select ‘ABN’. Secondly, in the free-text field to the right of the county code enter the parent title number(s) to which the property relates. Enter the full postal address of the property, including where possible the house (or office) name, the house (or office) number and the postcode. Where there is no recognised postal address, enter a description of the property. Enter the contractual start date of the lease as stated in the lease. Enter the contractual end date of the lease as stated in the lease. If you are completing the lease review return upon termination of the lease, please enter the date the lease ended. Enter the average annual rent (ignoring any rent-free periods) in pounds sterling under the terms of the lease, including any VAT payable on the rent. Enter the amount of any premium paid on the grant of the lease, plus any additional premiums paid, or to be paid, since the last return was submitted. Enter the relevant rental figure under the terms of the lease. This is the annual rent in relation to the transaction in question or, if that transaction is one of a number of linked transactions for which the chargeable consideration consists of or includes rent, it is the total of the annual rents in relation to all of those transactions. See paragraph 9 of schedule 19 to the LBTT(S)A 2013 and LBTT6012. Enter the Net Present Value (NPV). To calculate the NPV apply the formula in paragraph 6 of schedule 19 to the LBTT(S)A 2013 or see LBTT6011. Our website also has an online tax calculator to help you work this figure out. The actual amount of rent payable for each year in the remaining term. If the amount of rent to be paid varies in accordance with the provisions of the lease (for example, where there are rent reviews or in turnover leases), then a reasonable estimate should be provided (see LBTT6005). Enter the total amount of LBTT already paid on this lease to date, taking account of any adjustments made on previously submitted review returns. This field will be pre-populated but the figure is editable. This figure should equal the amount of LBTT payable on the lease after deducting any reliefs claimed and tax already paid. If after having read the declaration statement you are content to give your agreement to it, you must declare this by selecting the check-box beside the statement. You cannot submit and make an LBTT return without completing the declaration statement. Note: For the avoidance of doubt, where an agent is completing and submitting this return on behalf of a taxpayer, we will assume that the declaration is made by the agent specified in the ‘Agent Details’ sub-section of the ‘About the Tenant’ section of the return. Where legislation requires more than one person to make the declaration, you must do this by making a paper LBTT return. You must now select an appropriate ‘Payment method’ from the drop-down list. we accept Faster Payments. If you wish to use this option, select the ‘BACS/CHAPS’ option. See the separate ‘How to pay LBTT’ guidance on our website for more information on payment options and methods. Depending on which ‘Payment method’ option you selected, the latest “Payment Date for arrangements satisfactory” field will automatically update in accordance with the payment date rules covered in the separate ‘How to pay LBTT’ guidance on our website. Note: Any tax due is treated as paid on time if arrangements satisfactory to us are made at the same time as the LBTT return and the full payment is received no later than the return filing date. Are you claiming a repayment of tax? Select the radio button to tell Revenue Scotland whether you intend to claim repayment of the tax overpaid. Address of Bank or building society. Please check that the bank details are correct before completing the declaration confirming that the tenant(s) have authorised repayment to be made to that bank account. Once you are satisfied that all the details are correct you can submit the return. Interest is due on a repayment of LBTT and we will include this in the sum that we repay. We aim to deal with all repayment claims for which we have full information within 10 working days of receiving them.We will contact you if we need further information to enable us to make the repayment. The return will then be submitted electronically to Revenue Scotland and given a unique transaction reference which will be displayed to you on the screen. This number must be quoted when making payments in relation to the same transaction or when contacting us about the transaction.